eye-kon produced an extensive range of internal and external 3D Marketing Visuals for the Brewery Square development in Dorchester, Dorset. The main square of the development, which is housed within the site of the old Eldridge Pope brewery, features a 37-jet fountain and a large state-of-the-art screen used to show short films and major sporting events. Designed by CZWG Architects, Brewery Square sees the radical redevelopment of the site in Dorchester town centre, carving a mould for the subsequent areas of the grand master plan. The scheme incorporates the residential, commercial and cultural providing an interchange between commuters of the proposed train station to the south and the faces of the town centre to the north. The project is on going with some phases still to be completed; here at Eye-Kon we produced over ten computer generated images for various aspects of the project across each phase of the build. Capturing multiple views of the scheme, the architectural illustrations contributed to the design process by helping to dictate shape and materiality i.e. the cladding and colours used, the scale and use of the buildings congruently defined by the existing architecture and heritage. As the name suggest Brewery Square is home to two listed Brewery buildings; a nod to this heritage, supplying to the prestigious Queen Victoria as one of her very first brewers, the development hosts several leisure facilities including bars and restaurants, acting as social catalysts, as modern drink culture suggest; the new residential buildings envelope these communal “garden” centre pieces. Another extension of it’s brewery heritage is the squares largest and probably most significant resident, the 16ft bronze cast dray horse named drummer, a homage to him and the other horses that worked the brewery. He can be seen in our 3D render of Dray horse yard. Also see him parade into the square here. 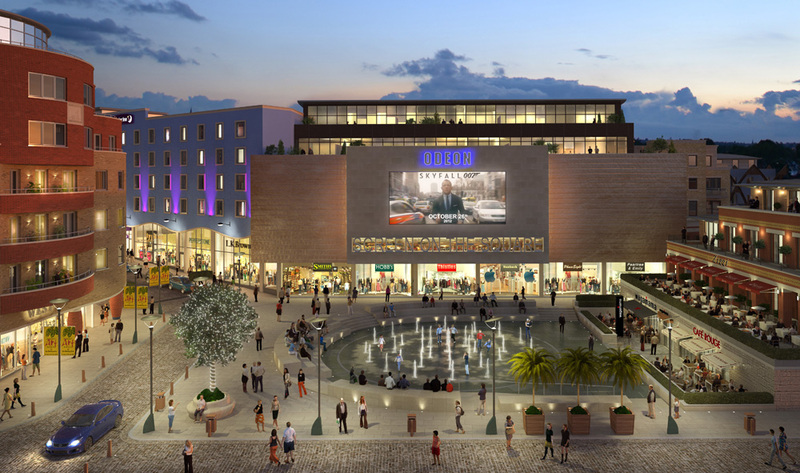 This is in place of the old Eldridge Pope brewery along with the new Odeon cinema, Eye-kon produced 3D CGI’s shown both in day and night; looking from different view points the architectural visualisations showcase the retail units that sit beneath the new Premiere Inn and the cinema. These 3D visuals were used by the client as promotional material to subsequence clients for the sale of said retail units.